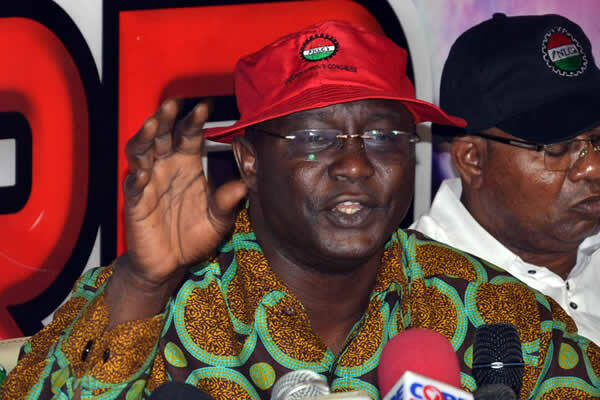 The Nigerian labour Congress (NLC), on Monday said that the Federal Government is yet to constitute the committee on the new National Minimum Wage. The NLC President, Comrade Ayuba Wabba said this in a statement issued in Abuja. He said that media reports saying that the committee has started work was not only false and misleading, but it is mischievous and that he was not aware of the existence of a such committee. Wabba said that in light of the sensitive nature of the subject matter, the story is not only alarmist, it constitutes an unnecessary overheating of the polity. “To the best of our knowledge, government accepted to set up two committees as a result of the major protest action by Labour following the increase in the pump price of petroleum products from N86:50 to N145. “These committees are Palliatives Committee and National Minimum Wage Committee. “Broadly-speaking, they are to make recommendations to government on how to cushion the harsh effects brought on the people by the sharp increase in the pump price of petroleum products as well as address other issues connected with the workings of the institutions in the downstream sector of the petroleum industry, especially the PPPRA. He added that similarly, the Committees are to make recommendations on other challenges militating against the regular supply of petroleum products. According to him, the acceptance of government to set up these committees was part of the process of addressing the concerns of labour. “On June 2nd, 2016, the Committee on Palliatives was inaugurated by the Secretary to the Government of the Federation. “An inaugural meeting chaired by the Honourable Minister of Labour and Employment, Dr Chris Ngige held immediately thereafter during which it was agreed that a tripartite committee (comprising representatives of Government, Employers and Labour) on a new National Minimum Wage be set up in line with extant law and procedure.” He said. Wabba said that although the outline of the work of the Committee and its membership were discussed, the Committee was not constituted. “Part of the explanation for this was that the annual International Labour Conference in Geneva to which the stake holders in Labour were invited was already in progress and members had to travel to Geneva. “the committee will be constituted in line with established law, convention and practice.” He added. The NLC President said that with this account, it is evident that there is a difference between the Palliatives Committee and the National Minimum Wage Committee. According to him, even before the fall-out from the increase in the pump price of petroleum products, the Nigeria Labour Congress with Trade Union Congress had formally submitted a proposal to government for a new minimum wage. “This action was informed by the fact that a new minimum wage was legally due after five years, and couple with this, inflation and major devaluations of the Naira had rendered the N18,000 minimum wage unrealistic. “Without the slightest intention to pre-empt the direction of discussion, realistic minimum wage at the moment will have to take on board the recent complications created by the N145 pump price of petroleum product and the floatation of the Naira as an economic policy and their aftermath.” He said. Wabba added that the earlier figure by NLC and TUC may have been rendered inappropriate by these recent developments.